So begins Tony Palmer‘s introduction to Bird On A Wire, a film he made in 1972, but which had never been screened in Tony’s intended version until 2010. 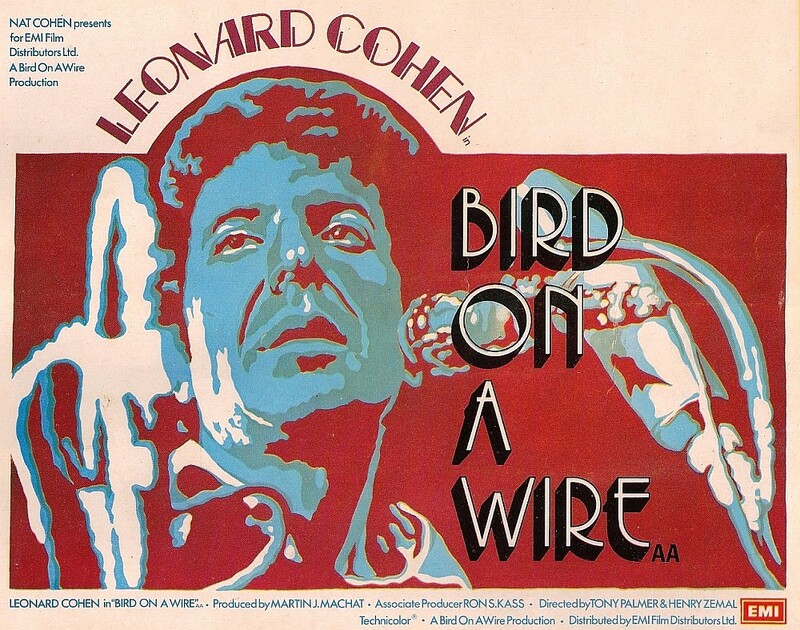 Bird On A Wire was made at the request and expense of Marty Machat, Leonard Cohen’s longtime manager. It followed Cohen during his 1972 European tour that took him from Dublin to Jerusalem. Tony Palmer, by then a veteran of several years of documentary film making, having profiled many of the era’s key figures in popular and classical music, captured Cohen at the height of his early success. Palmer completed his film shortly after the tour ended, around mid 1972, but Cohen did not like the finished result. He told Palmer that it was “too confrontational”, and in a later interview with Melody Maker published in February 1973, he called it “totally unacceptable”. He requested his friend and editor on the film, Henry Zemel, to re-edit the film, a process which increased the production time and budget significantly. Finally, two years after it was shot, the alternate cut of Bird On A Wire received it’s world premiere on 5th July 1974, at the London’s Rainbow Theatre, a famous music venue of the time. Poster of the 1974 release of Bird On A Wire. Detail of the poster, including a co-director credit for Henry Zemel (misspelled as Zemal). Newspaper ad for the premiere of Bird On A Wire at the Rainbow, London. The film was met with indifference by the critics, and pulled from circulation after a few screenings. It then mysteriously disappeared, available only on poor quality bootleg VHS copies, passed around from fan to fan. A detail from the review of the Alternate Cut of the film by Bob Woffinden, circa 1974. Tony Palmer’s cut of the film was never screened and was presumed lost until around 2009, when Steven Machat, son of Cohen’s manager, Marty, discovered the cans containing fragments of the original footage, but also the original audio track, allowing Tony to put the film back together in the cut that he initially envisioned. It was first screened in 2010, at the Leonard Cohen Festival in Krakow, Poland and later premiered in Toronto, Canada. The film works in several ways. 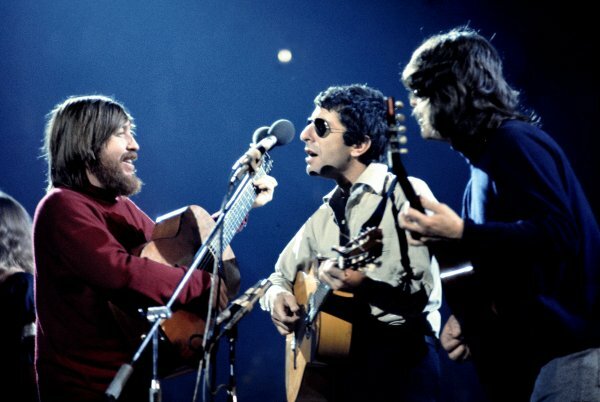 It’s a document, first and foremost, of that 1972 tour that Leonard Cohen undertook with his band, which included singer Jennifer Warnes, and Bob Johnston, legendary producer to Bob Dylan and Johnny Cash amongst others. LC with Jennifer Warnes to his right. LC with Bob Johnston on the left. It is also a profile of Cohen at that time, capturing his approach to his work, his colleagues and his audience. But, in its reincarnation, Bird On A Wire is also a document of a different time, of an era when protest was common, when audiences were politically engaged, when they went to gigs for more than just a night out. Finally, the film is also a document of the early stages of a type of documentary style, of fly on the wall, cinema verite film making, made possible by smaller equipment and faster film stock. During his over 40 years as a film maker, Tony Palmer has made over 100 films. He’s made films about popular culture icons such as The Beatles, Cream and Ginger Baker, Frank Zappa, about figures from the classical world, including Benjamin Britten and Maria Callas, as well as entertainers such as Peter Sellers, and even about Bobby Moore, the captain of the victorious 1966 England World Cup football team. 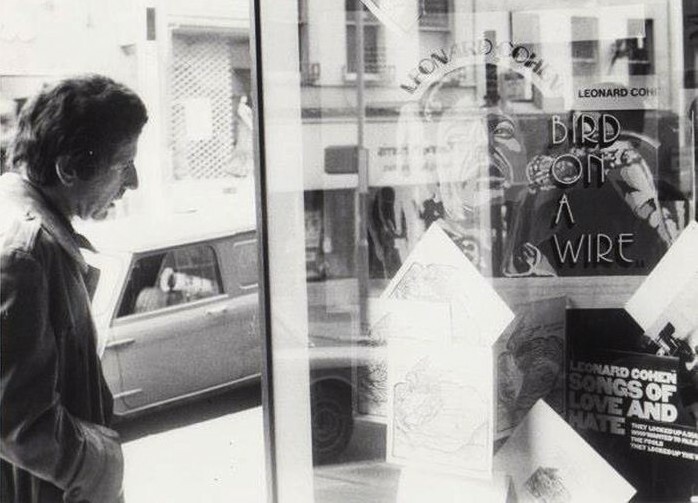 Here we hear him speak of many of the people he’s met during his long career, but always with the view of illustrating his relationship with Leonard Cohen and the film they made together so long ago, in March and April of 1972. From the personal collection of Emily Bindiger, backing singer on LC’s 1974 tour. 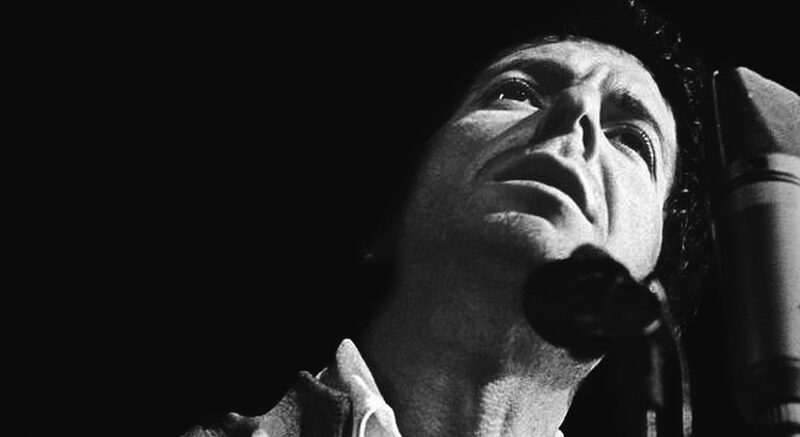 Clips from Leonard Cohen: Bird On A Wire: courtesy of Tony Palmer. 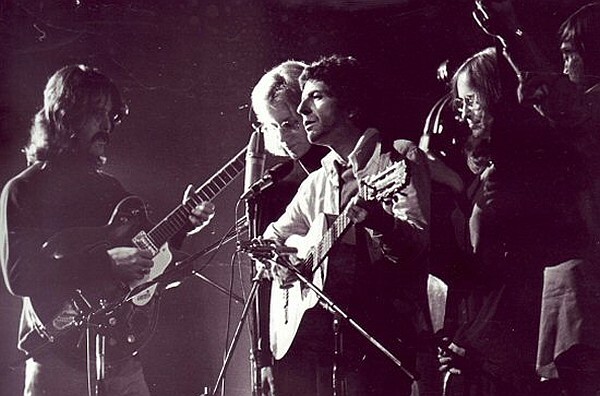 Photos of LC, Bob Johnston and Jennifer Warnes: by Claude Gassian, courtesy of Tony Palmer. Photo of LC by record store: Emily Bindiger, courtesy of Dave Curless. Archival newspaper clippings: courtesy of Dave Curless.